This listing is for a gently used VWR Magnetic Stirrer. Instrument comes with analog controls and plugs into a standard 115V electrical outlet. The platform is is four inches by four inches and constructed out of ceramic. 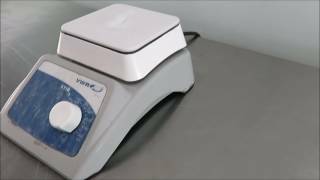 The VWR Magnetic Lab Stirrer design allows the user to put virtually anywhere within their lab. Contact us with questions about our used lab equipment listings. Instrument is fully tested and in great working condition. All our instruments carry our standard warranty and ship within 1-3 business days.